Astronomers have discovered the most unusual planetary orbit ever, given away by a flash of reflected light beamed back by the planet’s atmosphere. While most planets (including those in our Solar System) have roughly circular orbits, researchers have spotted some exceptions that form an elliptical path around their star. The newly discovered planet HD 20782 has the weirdest one yet: a long, flat ellipse that takes the planet way out into space before it ‘slingshots’ around its star at a very close distance. Consider the distance between Earth and the Sun, around 149 million km (93 million miles). At the most distant point, HD 20782 and its star are 2.5 times further apart than this – at their closest point, they’re just six-hundredths of the same distance from each other (that’s much closer than Mercury is to the Sun). Weigh those distances up, and you can begin to see just how unusual this planet’s orbit is. A team from researchers from San Francisco State University used a satellite-based telescope to catch a flash of reflected light from HD 20782’s atmosphere as it flew around its star, thus helping to confirm the path the planet is taking. Unlike other planets, HD 20782 doesn’t have time to react to the brightness of its star. Icy materials in the atmosphere are what make a planet reflective, but you would expect these materials to burn up as they get close to a star. In the strange case of HD 20782, there isn’t time for that to happen. “[The planet is] around the mass of Jupiter, but it’s swinging around its star like it’s a comet,” said lead researcher Stephen Kane. Now the question is: what caused HD 20782’s unique orbit? It might have collided with another planet, Kane’s team suggests, or the gravitational pull of another star might have something to do with it. HD 20782, which is some 117 light-years away from Earth, offers a “particularly lucrative observing opportunity”, according to the astronomers. Now they want to gather more data to understand how the planet handles such a brief and blistering close encounter with its sun, and to look more closely at the planet’s atmosphere. 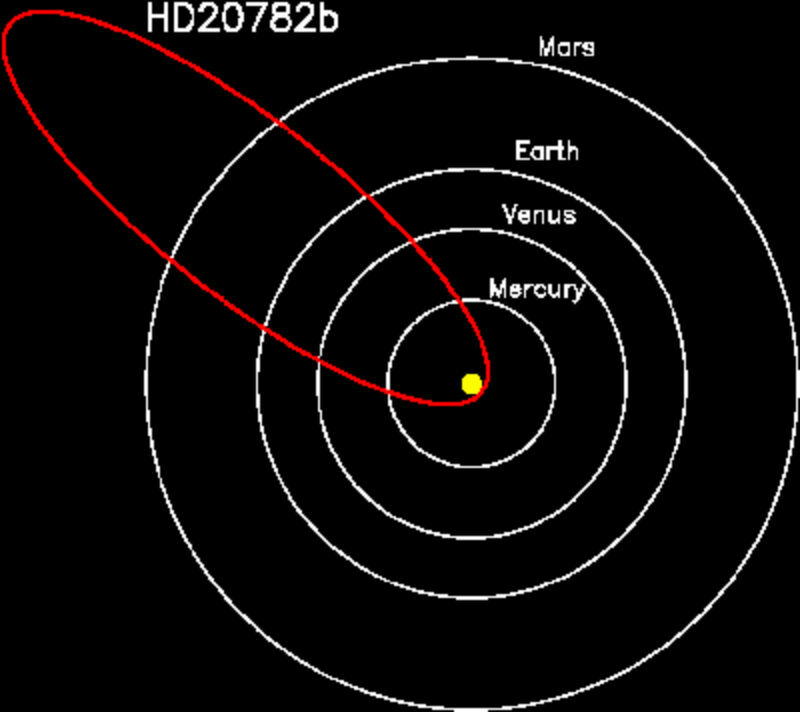 See the graphic below, which shows the orbit of the planet HD 20782 relative to the inner planets of our Solar System. HD 20782’s orbit more closely resembles that of a comet than a planet.